Electro Mechanical Slider - Venture Mfg. Co.
Venture Mfg. Co. provides electromechanical sliders as part of the gate operator product inventory. As the name suggests, sliders are designed to open gates by automatically sliding them from left to right and vice versa. 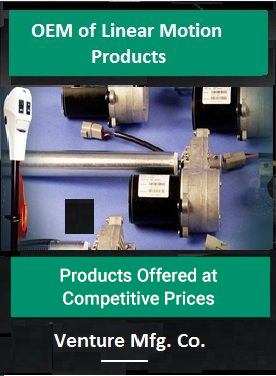 As the authorized Byan Systems Inc. distributor, Venture Mfg. offers customers the M4 electromechanical slider. The product is designed to provide smooth, fast, and flexible gate movement. This product can be used on light as well as heavy sliding gates. To ensure that the slider will not become cumbersome in an application, it is designed in a compact manner, which can be easily installed and removed. It is fitted with a rack and pinion system, which allows for fast and easy movement. The slider also provides benefits of silent operation, and the ability to perform even in harsh application environments. The M4 electromechanical slider distributed by Venture Mfg. Co. can meet all requirements of automated sliding doors used in commercial and industrial applications. Click here to get more details on the product. If you have any other queries, please feel to contact us.